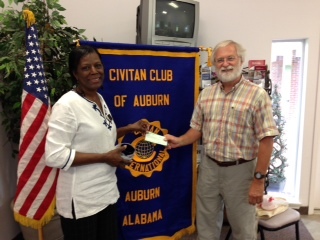 Elsie Lott, East AL Community Market and Kirk Iversen, Auburn Civitan Club president. At the Auburn Civitan Club meeting on August 1, 2014, at the Eagle’s Nest of Monarch Estates, Mrs. Elsie Lott was the speaker. Mrs. Lott is the Coordinator of the Community Market, an agency of the Food Bank of East Alabama, heading up a full-time professional management team. Clients of the Community Market include senior citizens, the working poor, children, single parents, abused and neglected persons, victims of domestic violence, mothers and infants at nutritional risk, the newly unemployed, and persons with disabilities or emotional illness. They must be from Lee County. Also served are victims of disasters and people with emergency needs. The Community Market is open six days a week with senior citizens being served on Monday and Tuesday mornings and families and individuals being served on Wednesday through Saturday. The food offered by the Community Market is bought from the Food Bank of East Alabama. Also many kinds of fresh fruit, produce, day- old desserts and bread are donated from local grocery stores and bakeries. The outreach of the Community Market is made possible through community support. Volunteers from many local churches and countless Auburn University work regularly. Mrs. Lott coordinates their work. Those with an emergency need may call 334-749-8844 to make an appoint for an interview. This entry was posted in Charities, Programs and tagged Community Market on October 22, 2014 by kviversen.